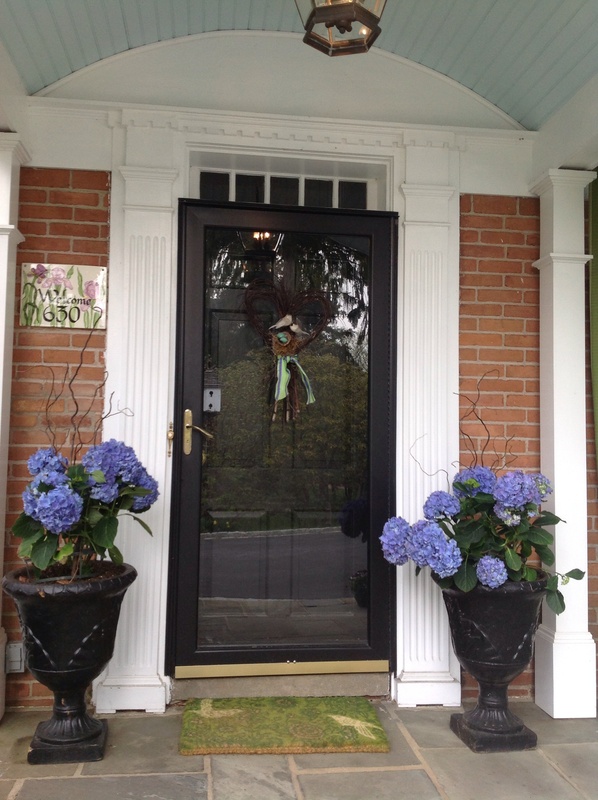 Front porches conjure romantic images of relaxing while watching the world go by in the neighborhood. 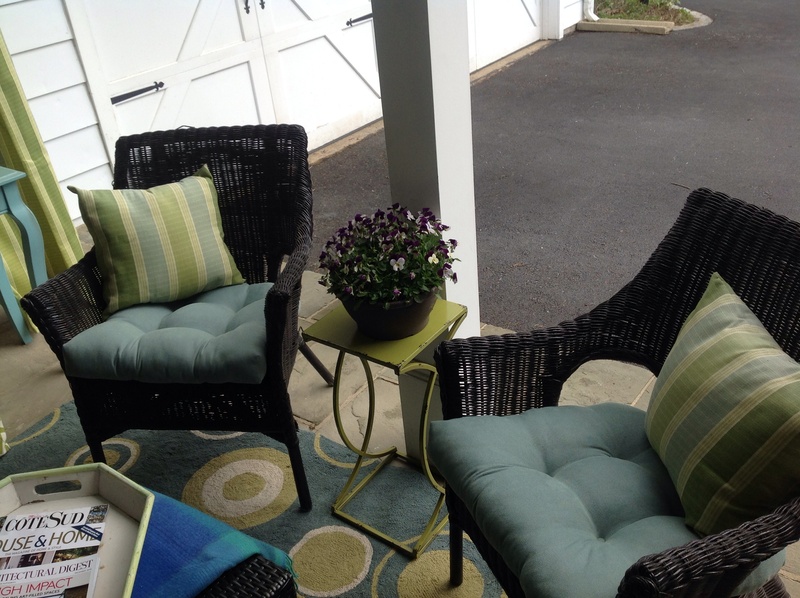 Our front porch,with a couple of lonely chairs, held untapped potential I seized to create an outdoor room for reading, relaxing and entertaining. It is one of my favorite decorating projects of all time! 1) Bring in good lighting: we had overhead lights and added lanterns with candles. 2) Provide comfortable seating. Mix and match the linens for a custom look. 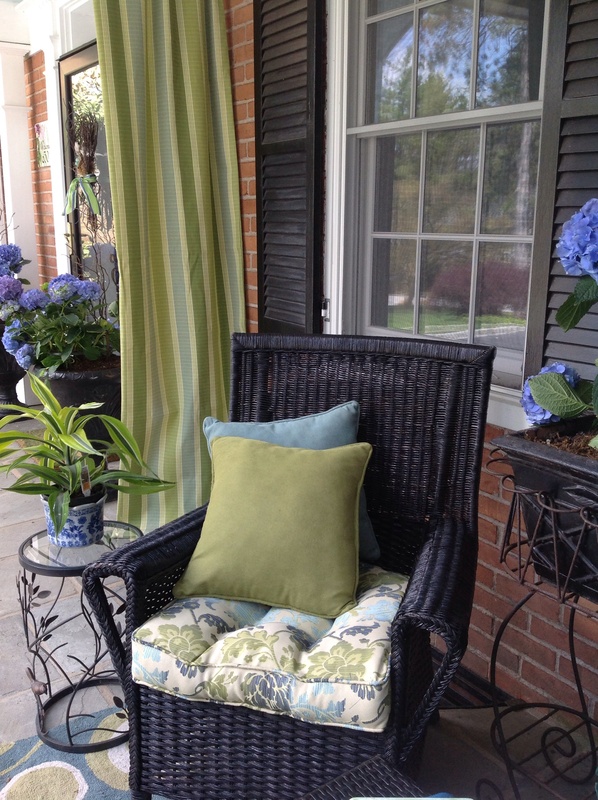 There are great outdoor fabrics available now. 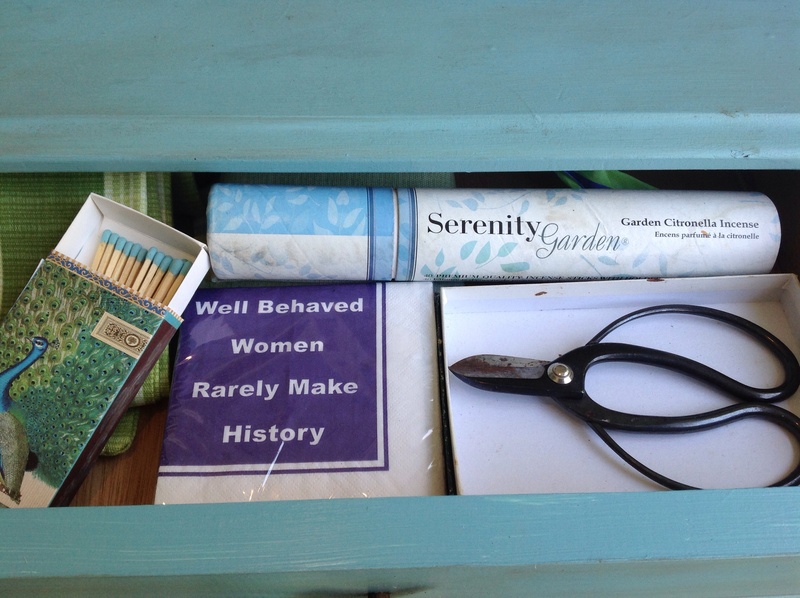 4) Provide places to rest drinks, books, game boards, etc. Think of how you want to use your room. 5) Bring in unexpected accents: wall art, graphic prints, an area rug to anchor the space, furniture pieces that can withstand the elements. 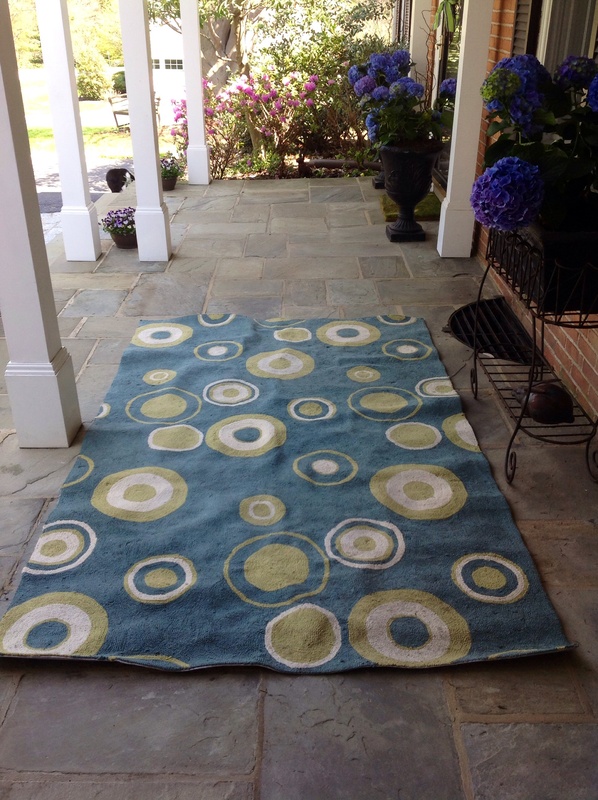 There are fantastic outdoor rugs available in every color now and they can be simply hosed down to clean. 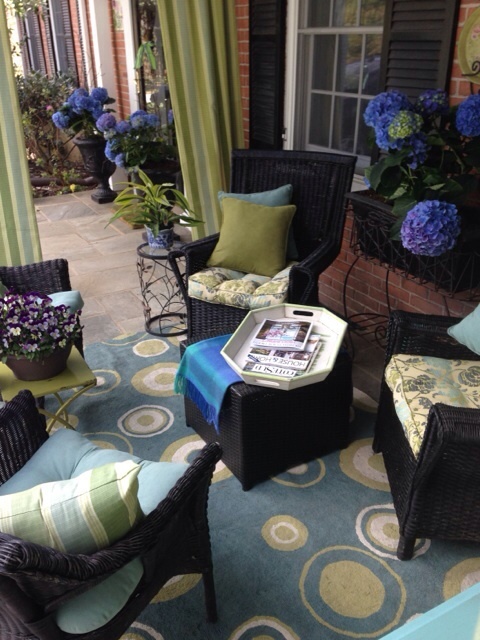 6) Unite your outdoor and indoor decorating style so the spaces flow seamlessy. 7) Delineate the room with curtains or furniture placement. Make it welcoming! 8) Control the elements with curtain panels, overhead shade, etc. Set out a throw for chilliy days. Have something for insect control. I have citronella incense sticks I put in my flower pots. I love watching a summer storm roll by under cover but still outdoors from our porch. 9) Bring in architectural interest. 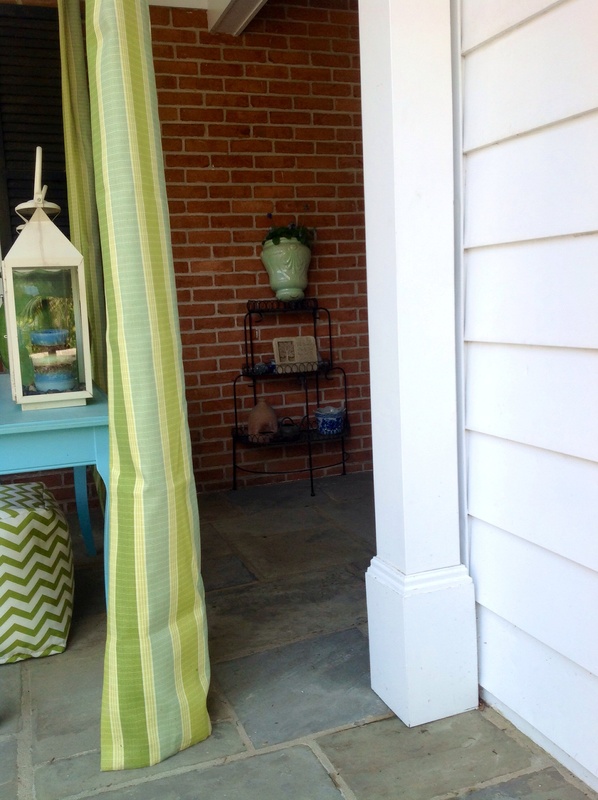 We used bead board on our ceiling and have incorporated the porch pillars in the décor. 10) Think of color above or bringing in an unexpected light fixture like a chandelier. We painted our porch ceiling robin egg blue. 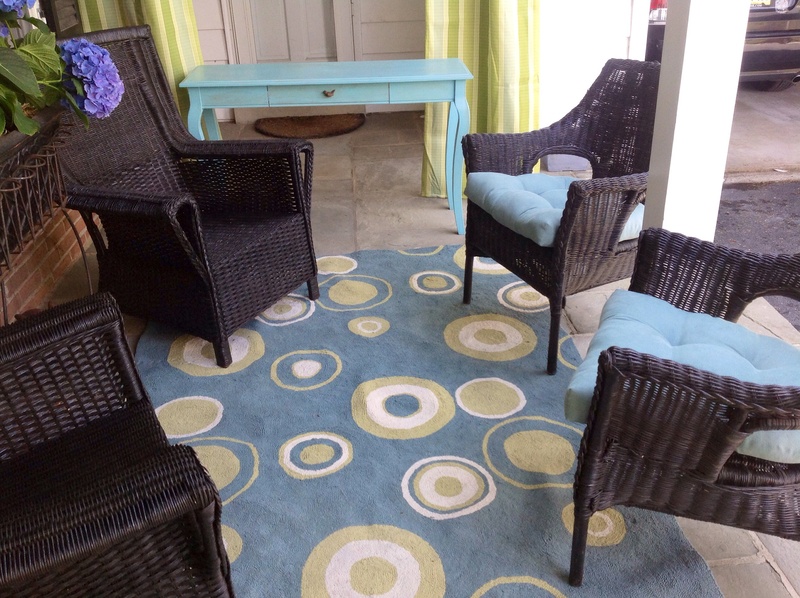 Outlining the space with an outdoor area rug. It is easier to start a decorating project with the rug and choose other colors from there. 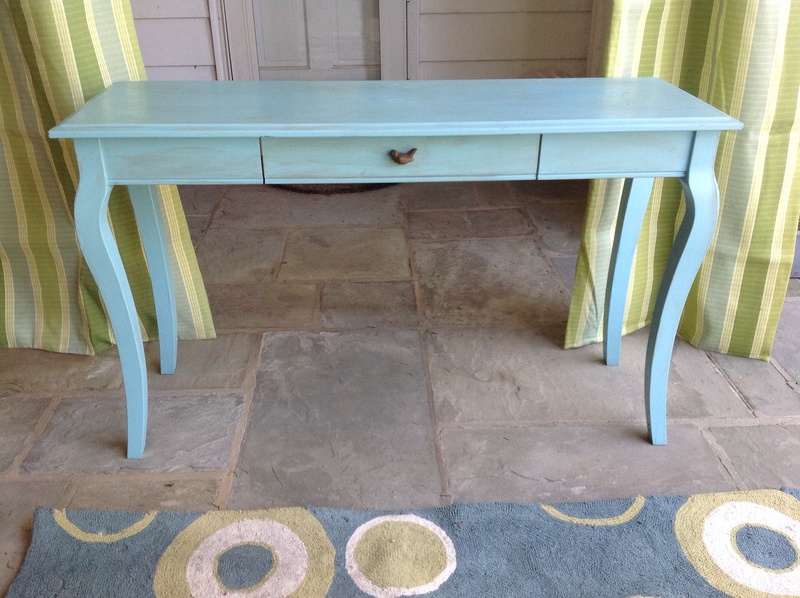 Using a trash-picked console table to deliniate the space, conceal an off center mudroom door, and keep access to the mudroom entrance separate. 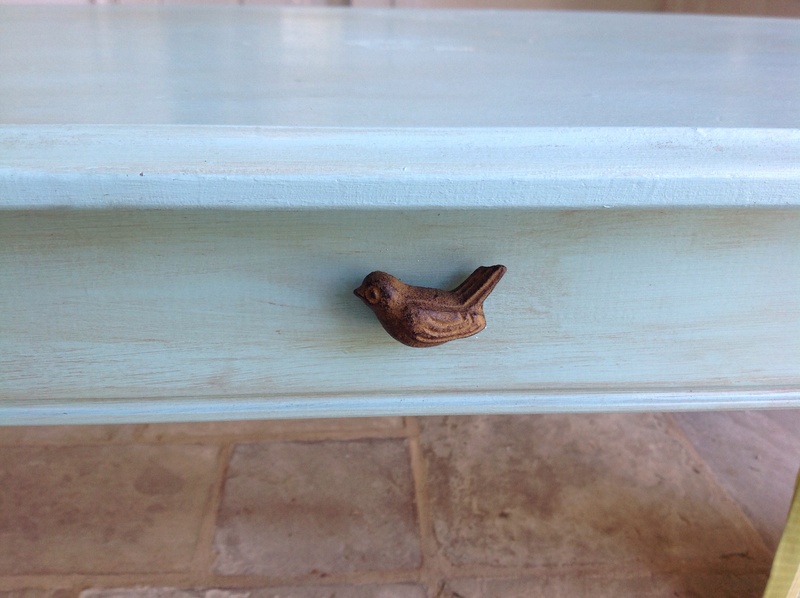 I painted the table a beautiful turquoise and swapped out an ugly drawer knob for a cute bird one. I aged the blue with some rubbed on brown glaze. 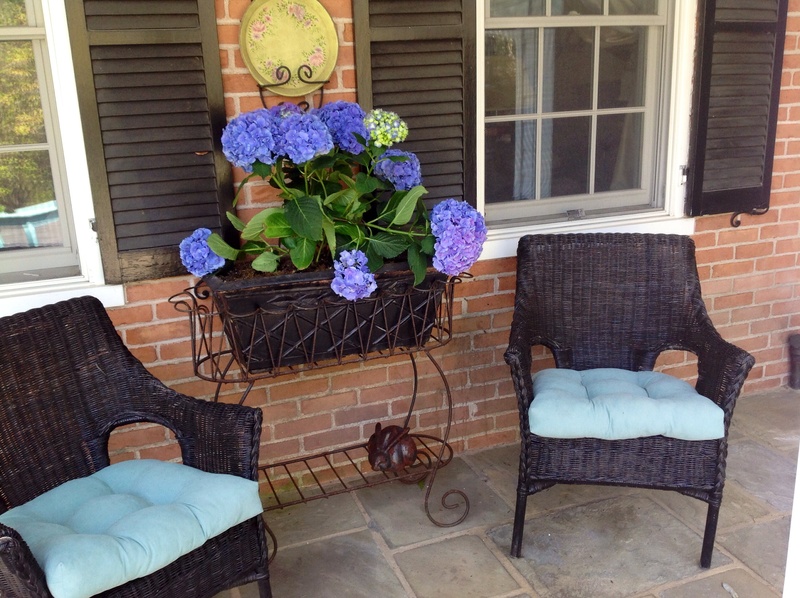 Adding to the 2 existing black wicker chairs from Pier 1, I spray painted 2 thrift shop finds in black Krylon paint. Although not matching, the 4 chairs work together and create a cozy conversation area in a narrow space. 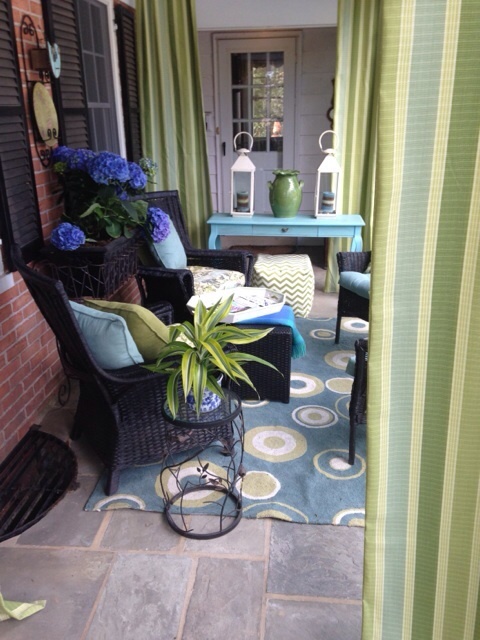 Using outdoor fabric, I made 4 curtain panels to deliniate the space, bring in color and pattern, and especially to enjoy having them flow in the breezes and make the space feel like a room. In order that they are pretty no matter what side they are seen on, I folded the fabric width over itself before sewing the panels. 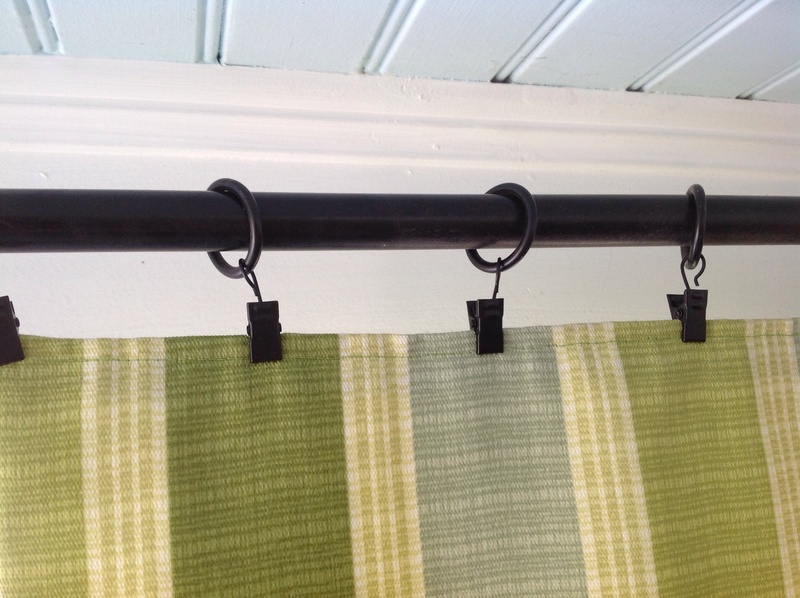 I hung them on really sturdy curtain rods with loops that clip onto the panels. I store them, clips and all. After 3 seasons the fabric has not faded nor absorbed dirt. Amazing! I think they make the space. 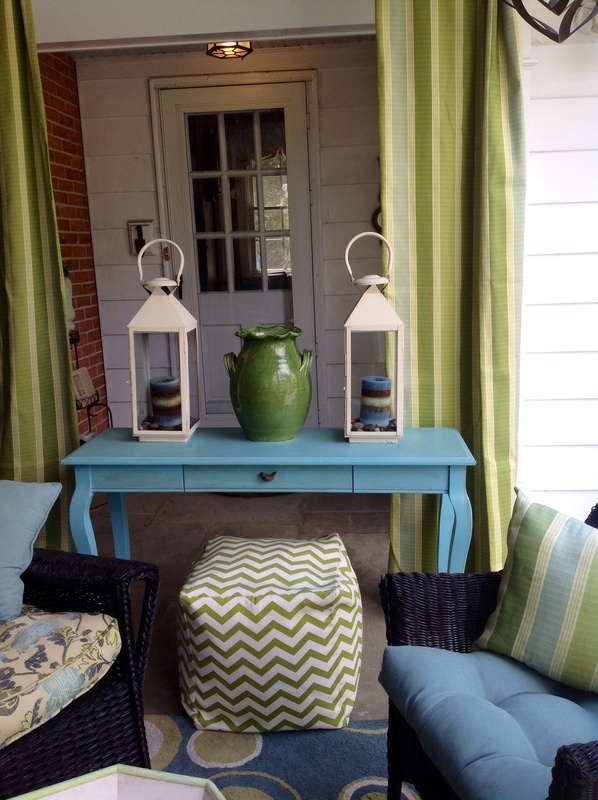 Accessorizing the console: 2 lanterns with blue candles on a bed of river rock, a large green pottery vase as sculpture and to block the mudroom door from view, and a chevron patterned bean bag ottoman(Tuesday Morning) for additional seating or to hold trays or reading material. Linens on chair are complimentary but not matched to the other chairs. They are comfortable and colorful. Another small side table with a bird and vine motif is useful but unobstructive to traffic flow. Throw pillows are made from left over drape fabric. Small table between chairs for drink placement or to hold flowers. A warm throw is draped over the ottoman while a large tray corrals magazines and can be put into service to serve food and drinks. We hung a plate rack on the brick wall above a flower planter and have a decorative metal plate and a bird house as wall art. 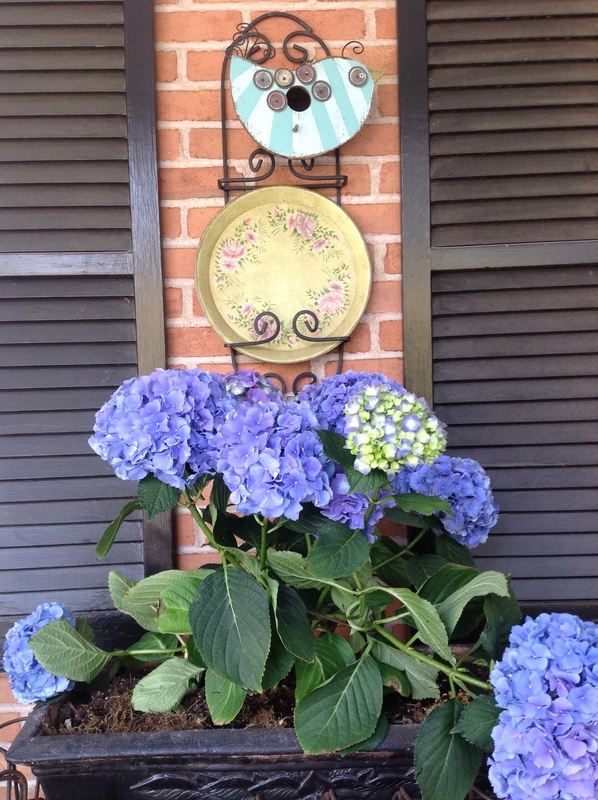 When I can find them, blue hydrangeas are my favorite porch flowers! They last for months then I plant them in the garden as perennials. When I can’t find blue ones I go with white flowers in the planters. The entrance to the mudroom door behind the porch curtains. Welcome! 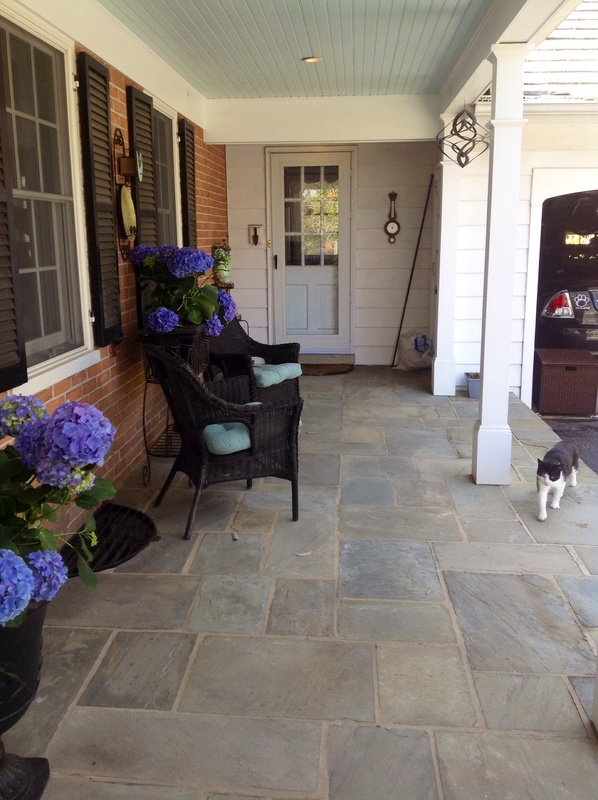 What outdoor room will you create? 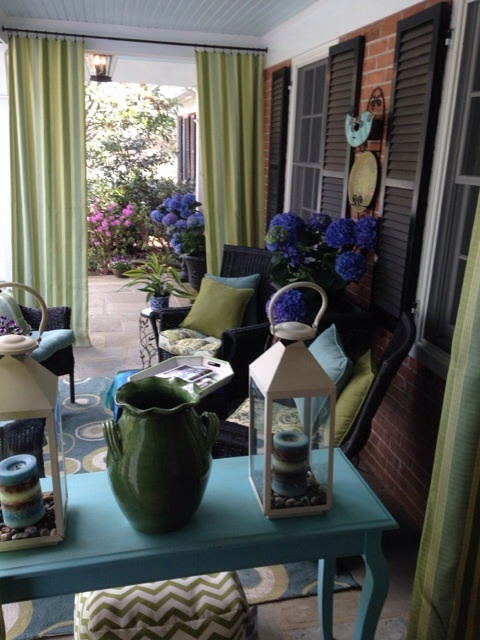 This entry was posted in Entertaining, Gardening, Home Décor and tagged blue hydrangeas, ottoman on porch, outdoor curtains on porch, Outdoor room, outdoor rug, porch living, repurposed console table for a porch, side tables on porch by Johanne Lamarche. Bookmark the permalink. This is just lovely, Johanne. I especially love how you’ve used your fabrics to define the space. Well done! Thanks Bonnie! I was thinking of you today. Our youngest will attend Elon in the fall and Chris and I were talking of stopping in Ashville after parent weekend. Will let you know if we do! They are all so very cozy! What a lovely AND relaxing front porch you have! Oh, how I wish!!! We have almost no porch whatsoever. I’d like to change that soon, and your tips would work well for decorating it to make it super inviting. 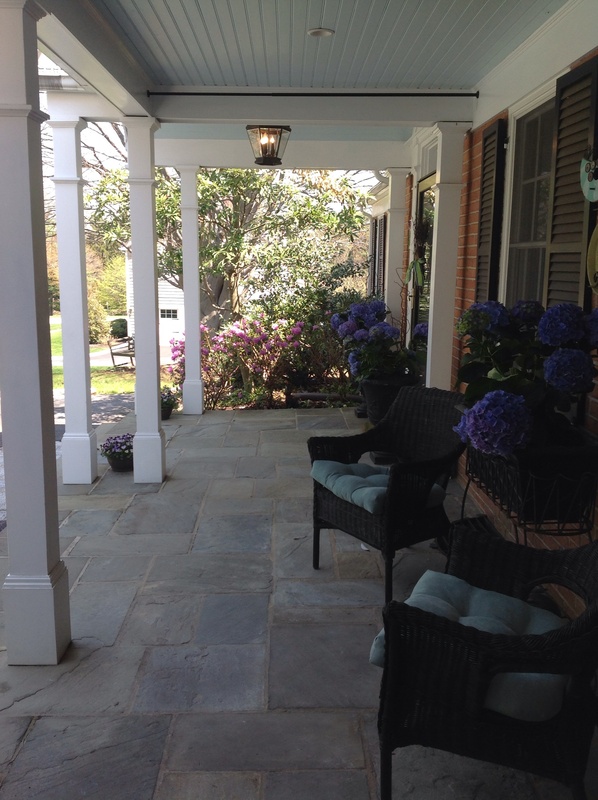 It’s one thing to HAVE a big porch, and completely something else to actually decorate it so that it looks like a welcoming haven.